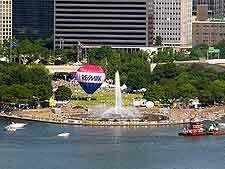 With so many world-class entertainment venues and leading sports stadiums, the city of Pittsburgh is extremely proud of its culture and stages a series of seasonal festivals, often with a distinctive 'Three Rivers' flavor. Located in downtown Pittsburgh, the David L. Lawrence Convention Center lies on the Fort Duquesne Boulevard and hosts numerous quality events, local festivals, shows, conventions and celebrations. There are usually plenty of events and things to do at the city's Mellon Arena (formerly the Civic Arena), which is the official home to the city's Pittsburgh Penguins ice-hockey team and also regularly plays host to concerts, local festivals, Disney-style ice-skating shows and wrestling contests. The city is also home to many quality theaters and music venues, such as the Ballet Theater, the Benedum Center and the Heinz Hall, where the Pittsburgh Symphony Orchestra is often to be found performing.